No one, with the exception of his parents, my parents and a brother and two sisters of his living in Haifa, knew it was to take place. He felt strongly urged to keep it a secret, knowing from past experience how much trouble any major event in the Cause invariably stirred up. It was therefore a stunning surprise to both the servants and the local Baha'is when his chauffeur drove him off, with me beside him, to visit the Holy Tomb of Baha'u'llah on the afternoon of 25 March 1937. His heart drew him to that Most Sacred Spot on earth at such a moment in his life.. . . When we arrived at Bahji and entered the Shrine he requested me to give him his ring, which I was still wearing concealed about my neck, and this he placed on the ring-finger of my right hand, the same finger that corresponded to the one of his own on which he himself had always worn it. This was the only gesture he made. He entered the inner Shrine, beneath the floor of which Baha'u'llah is interred, and gathered up in a handkerchief all the dried petals and flowers that the keeper of the Shrine used to take from the threshold and place in a silver receptacle at the feet of Baha'u'llah. After he had chanted the Tablet of Visitation we came back to Haifa and in the room of the Greatest Holy Leaf our actual marriage took place. . . . Except for this visit, the day he told me he had chosen to confer this great honour on me, and one or two brief moments in the Western Pilgrim House when he came over for dinner, I had never been alone with the Guardian. There was no celebration, no flowers, no elaborate ceremony, no wedding dress, no reception. 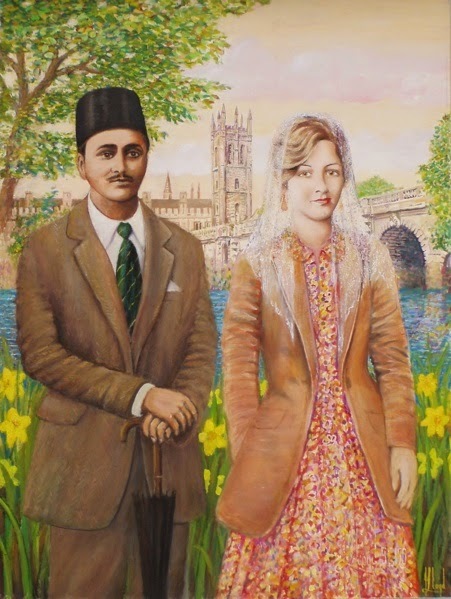 His mother and father, in compliance with the laws of Baha'u'llah, signified their consent by signing our marriage certificate and then I went back to the Western Pilgrim House across the street and joined my parents (who had not been present at any of these events), and Shoghi Effendi went to attend to his own affairs. At dinner-time, quite as usual, the Guardian appeared, showering his love and congratulations on my mother and father. He took the handkerchief, full of such precious flowers, and with his inimitable smile gave them to my mother, saying he had brought them for her from the inner Shrine of Baha'u'llah. My parents also signed the marriage certificate and after dinner and these events were over I walked home with Shoghi Effendi, my suitcases having been taken across the street by Fujita while we were at dinner. We sat for a while with the Guardian's family and then went up to his two rooms which the Greatest Holy Leaf had had built for him so long ago. The quietness, the simplicity, the reserve and dignity with which this marriage took place did not signify that the Guardian considered it an unimportant event-on the contrary. Over his mother's signature, but drafted by the Guardian, the following cable was sent to America: “Announce Assemblies celebration marriage beloved Guardian. Inestimable honour conferred upon handmaid of Baha'u'llah Ruhiyyih Khanum Miss Mary Maxwell. Union of East and West proclaimed by Baha'i Faith cemented. Ziaiyyih mother of Guardian.” A telegram similar to this was sent to Persia. This news, so long awaited, naturally produced great rejoicing amongst the Baha'is, and messages flooded in to Shoghi Effendi from all parts of the world. Can someone please give me higher resolution of this picture? It is told, that once Hárúm ar-Rashid dreamed that all his teeth had fallen out. Hárúm ar-Rashid became very sad and disturbed. He ordered the soothsayer to be imprisoned. Then he asked if there were any other soothsayers. The answer was affirmative and another one was brought to him. The caliph asked the new soothsayer to interpret the dream. This soothsayer said, 'This dream indicates that his Excellency and caliph will have a longer life than others. `Abdu'l-Bahá| Where there is love, nothing is too much trouble, and there is always time. Posted on Lavezzo's Blog, July 17, 2009 "Where there is love, nothing is too much trouble, and there is always time." – Attributed to `Abdu'l-Baha The extract you mention is a variation of a pilgrim's note. ...now it's quoted by many, including a great song by Conrad Lambert. Thanks for information from this blog.